Hannah Kovich is the Investor Relations Manager for WaterEquity, a social impact investing initiative within Water.org. 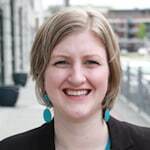 As Investor Relations Manager, Hannah is responsible for thoughtful stewardship of donors and investors through the crafting of effective due diligence materials, performance reports and the development of internal structures and processes. Previously, Hannah served as a member of Water.org’s Strategic Alliances department as a part of the grants team. Prior to Water.org, Hannah supported regional food security at Harvesters – the Community Food Network. As we recognize World Water Day, Water.org is launching a $50 million fund, targeting enterprises in India, Indonesia, Cambodia and the Philippines that help the poor meet their water and sanitation needs – with a particular focus on MFIs. This seven-year fund, managed by the nonprofit's WaterEquity initiative, aims to reach at least 4.6 million people at the BoP, while offering pre-tax financial returns of 3 percent.